"Saturn, like all of the planets the Voyagers visited, was full of exciting discoveries and surprises," said Ed Stone, Voyager project scientist at Caltech in Pasadena, California. "By giving us unprecedented views of the Saturn system, Voyager gave us plenty of reasons to go back for a closer look." Voyager's Saturn flybys provided a thrilling look at the planet's moons -- a diverse menagerie of worlds, each with unique character and charm. Voyager's images transformed the moons from points of light to fully realized places. Dramatic landscapes on Tethys, Dione, Rhea, Iapetus and other moons tantalized scientists with features hinting at tortured pasts. "The stars of the Saturn system are the moons, which surprised all of us on both the Voyager and Cassini missions," said Linda Spilker, project scientist for Cassini at NASA's Jet Propulsion Laboratory, Pasadena. Spilker also served on the Voyager science team. One of the key findings of the Voyagers' visits to Saturn was that the planet's moons had evidence of past geological activity and that Enceladus -- the brightest, most reflective planetary body scientists had ever seen -- could still be active. Cassini set out to delve deeper into the nature of these moons, and found that, indeed, icy Enceladus has geysers erupting to this day. Cassini also confirmed that Enceladus is the source of Saturn's E ring, which was suggested by Voyager. But while Voyager images of wispy terrain hinted at ice volcanoes on Dione, Cassini found this feathery coating was actually a system of bright canyons. Titan, Saturn's largest moon, was a high-priority target for the Voyager mission. Gerard Kuiper, for whom the Kuiper Belt is named, had discovered in 1944 that Titan had an atmosphere containing methane. Observations from both Voyagers showed that Titan's atmosphere was primarily composed of nitrogen, with a few percent methane and smaller amounts of other complex hydrocarbons, such as ethane, propane and acetylene. No other moon in the solar system has a dense atmosphere. Mission planners mapped out a path through the Saturn system that provided the gravitational boost needed to send Voyager 2 onward to Uranus. But because of intense interest in Titan's atmosphere, the giant moon was the higher priority. In fact, the team would have directed Voyager 2 much closer to Titan if Voyager 1 had not been successful in observing it. "To fly close to Titan, Voyager 2 would have swung upward out of the plane of the planets, and couldn't have gone on to visit any others," Stone said. "It was fortunate that Voyager 1's observations of Titan went flawlessly, so that Voyager 2 could continue traveling to Uranus and Neptune." To the Voyagers, Titan appeared as a featureless orange ball because of dense haze in its atmosphere. Seeing through this haze was a chief goal of the Cassini mission. Cassini carried cameras with infrared vision that could see through the haze, a radar that could map the surface in detail, and the European Huygens probe, which landed on the moon's frigid surface on Jan. 14, 2005. We now know, thanks to Cassini, that smoggy Titan has methane lakes and flooded canyons. Voyager discovered four new moons and sharpened our view of some that were previously known. The spacecraft also revealed how the gravitational pull of these satellites causes ripples in Saturn's rings, much like the wake of a ship on the sea. There were also surprising gaps in the rings, some caused by moons embedded within them. Voyager also revealed an immense hexagonal feature in the clouds that surrounded Saturn's north pole, which Cassini found was still going strong a quarter century later. Additionally, Voyager measured the wind speeds, temperature and density of Saturn's atmosphere. With Voyager's measurements as a starting point, Cassini further explored how Saturn's atmosphere changes with the seasons. While both missions have vastly improved our understanding of Saturn, its rings and moons, there are still mysteries galore. 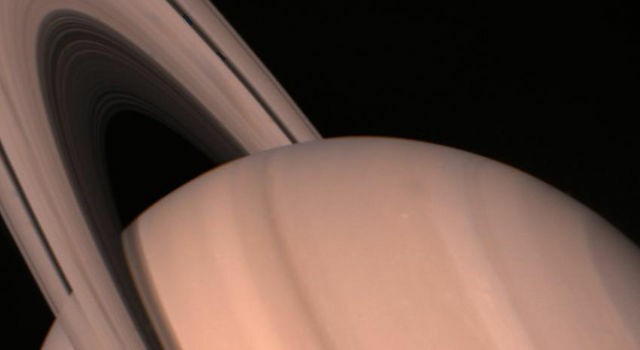 For example, the exact length of Saturn's day continues to elude researchers. The Voyagers measured it to be a period of 10.66 hours, but Cassini has measured two different, changing periods in the north and south. 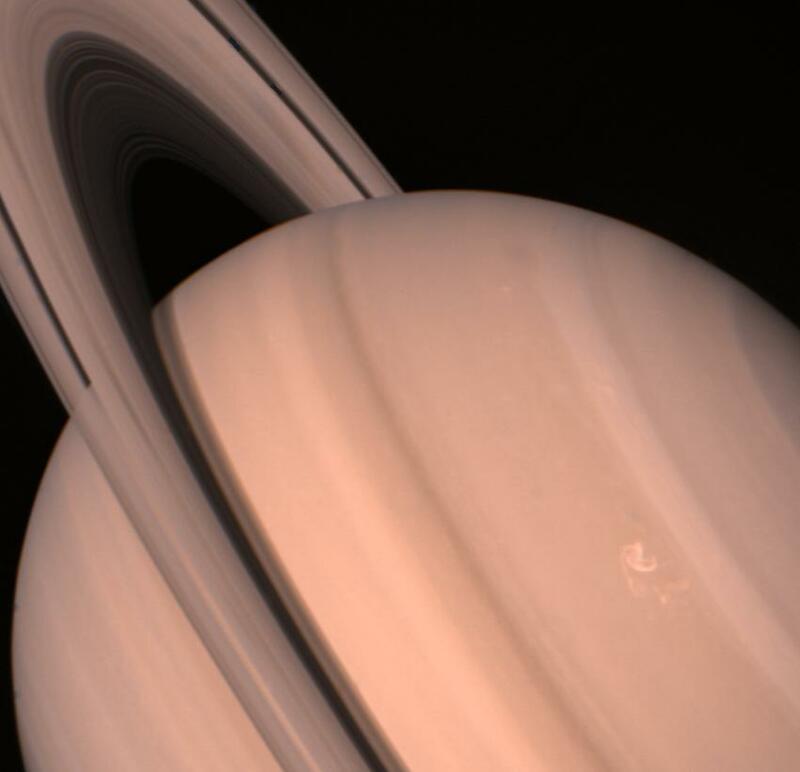 Voyager also made the first up-close observations of Saturn's rings, discovering new thin and faint rings, along with the ghostly features called spokes. But despite more than a decade of observations with Cassini, scientists are still unsure about the age of the rings -- they could be hundreds of millions of years old, or several billion. Cassini, in turn, has prompted new questions of its own, such as whether the ocean worlds Enceladus and Titan could be habitable. "The twin Voyagers rewrote the textbooks on Saturn, its rings and moons, and we couldn't wait to go back with Cassini," Spilker said. "New mysteries uncovered by Cassini will await the next missions to follow in the footsteps of Voyager." Voyager 2's mission of discovery continues to this day. It is now part of the Heliophysics System Observatory, a collection of missions that explore our space environment, and which contribute to protecting future missions on their journeys. Voyager now explores what's known as the interstellar boundary region, where material blowing out from the sun encounters similar winds from other stars.